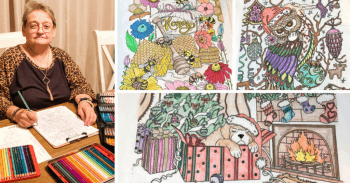 Hello, adult coloring fans! Today we’ve prepared something truly special for you. Our team interviewed several incredible colorists whose unique talent is recognized and whose works are loved by many people! They were very excited to share their experience and best tips with our audience. 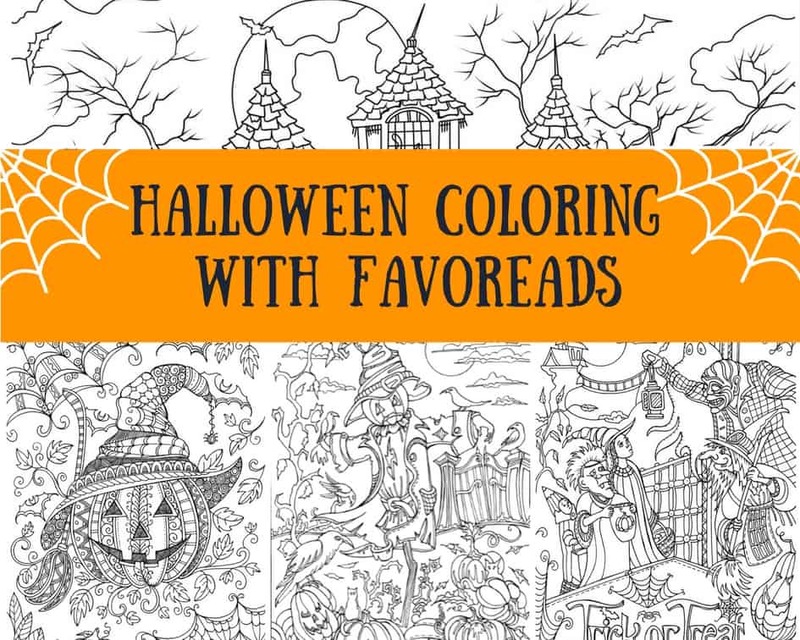 So put your seatbelts on and get ready for an awesome coloring ride! 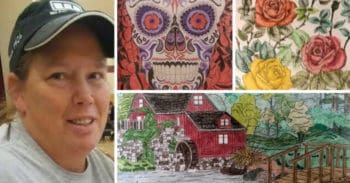 Have you ever come across these spectacular artworks finished by other colorists that just took your breath away? 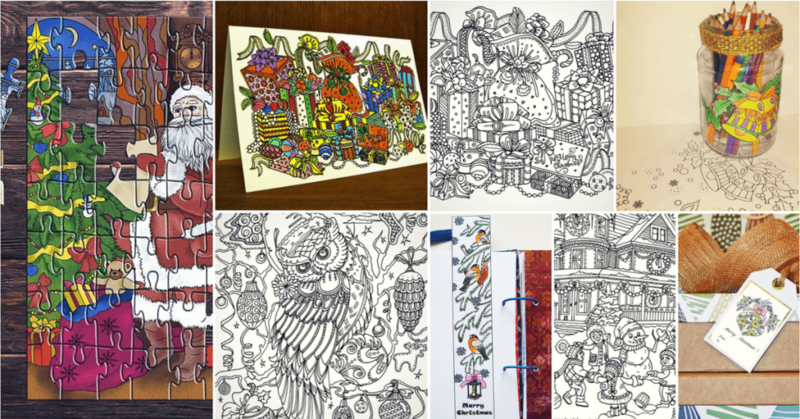 Have you ever wished your next adult coloring accomplishment looked like this? Or maybe you thought to yourself: no way I could ever be that good. If your answer is yes, then you absolutely need to read this article! It’s perfect for beginners and experienced colorists, for those who have doubts or question their talent, for those who want to learn and upgrade their skills. 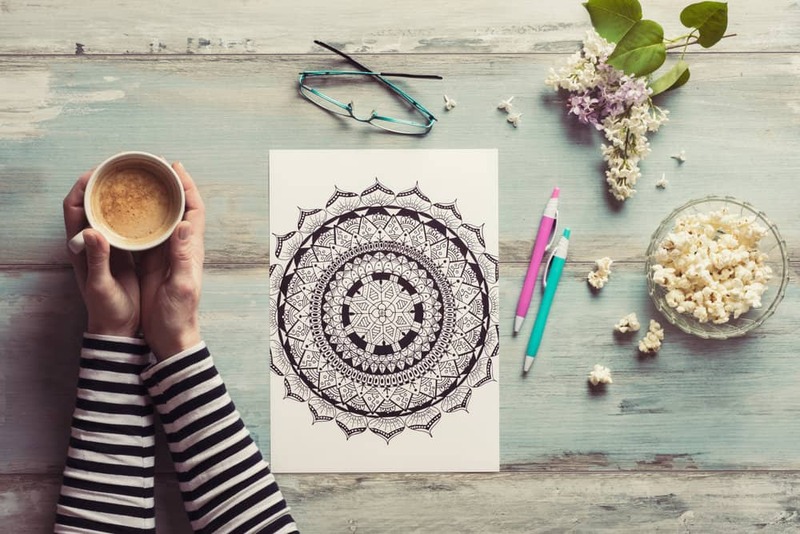 After reading all the amazing tips covered below you’ll definitely feel inspired and ready to conquer the coloring world! 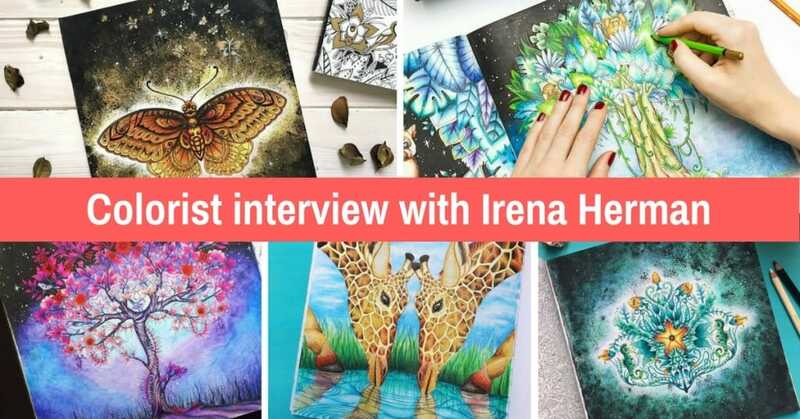 Let’s meet our first colorist Irena Herman. You can find her on Instagram or Facebook. 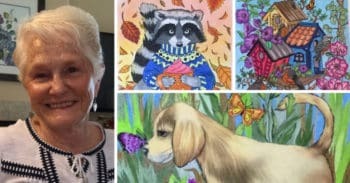 Check out some of her gorgeous artworks below. She was very kind to answer our questions and share her coloring secrets. Make sure you don’t miss a thing! 1. Irena, tell us a little bit about yourself. When did you start coloring and how did you learn it? I started coloring in late summer 2015 during some stressful period I had and it looked like a lovely way to relax more. I was never an artistic type even though I come from a very creative family. I felt like I didn’t know what I was doing, knew nothing about pencils or drawing, but just thought it was a nice opportunity for me to be more creative, too. I remember when I first saw colored pages of experienced colorists and thought I could never be that good. But that comparison with those beautiful works was also an inspiration to start exploring more. I was constantly curious and loved to practice how to achieve something better with my pencils. The process of learning never ends and still have lots of things to improve. 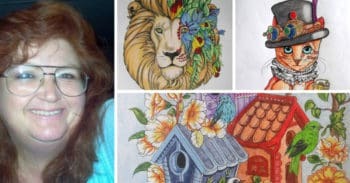 I love to color everything: animals, flowers, portraits or just simple mandalas. It is important for me to always color something different. It never gets boring and it’s more challenging that way. 3. What are your go-to coloring materials? Are you mixing materials or mainly use just one of them? 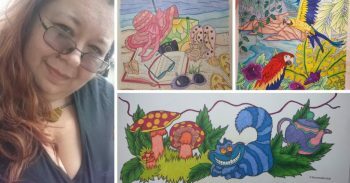 I started with mixing colored pencils and watercolor pencils, which are still my favorite and most often used media in coloring books. However, I learned with time that I can accomplish lots of nice effects with pens, gel pens, acrylic paint or watercolors so now I usually mix all those things. Inspiration can be easily found in nature or just random photographs I see. Sometimes it is just one colorful thing around me and I already try to imagine those colors on my next coloring. Plans can change when I color though and sometimes it doesn’t turn the way I planned. I usually improvise. That’s why I often start coloring 2-3 main things on the page and then decide about my next moves – whether I will put some neutral color to make other pop or just make everything bright. The longer you color and play with lots of different colors, it gets easier to combine them. 5. 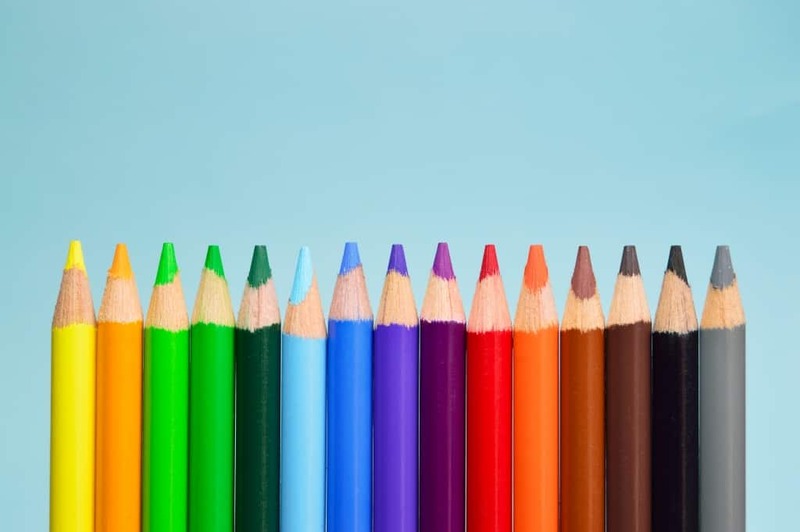 Do you have a special coloring workplace or any preparation rituals that help you get into the right mood? 6. What are the top 3 tips to help someone who is just a beginner colorist? Practice. If you feel like you are not good as you wanna be, watch tutorials and try to do it in your own way. Take some risks every now and then and try something new. Don’t be afraid to make a mistake, that’s how you will learn to avoid it next time. 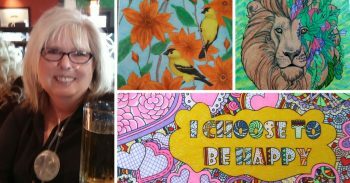 Join groups on social media and share your work with other colorists. Its a lovely and supportive community and we all share our experience and getting better with time. 7. What are your top 3 tips to those who have experience but want to upgrade their skills? Never hurry to finish your work, good things take time. Observe colors and textures around you more carefully and try to use them in your work. Experiment with more colors or mixed media and challenge yourself with something new every time, like creating volume and playing with light. 8. What do you think are the easiest types of designs to start with? Like “people”, “animals”, “mandalas” or something else? What did you start with? I started coloring flowers first, it seemed like the easiest way how to learn shading and blending. But not everyone is the same and someone will find that boring and go straight to coloring people. There are no rules, everyone has to follow their instinct and can choose whatever they feel like coloring. 9. What is your key to creating volume and such realistic artworks? I experiment with lots of colors to create a volume. I love high contrasts and vibrancy so often work with dark backgrounds to make main objects on the page pop. I use darker colors for things that should recede on the page and light, warm colors for objects in front. Still learning about it. 10. How to create a realistic skin tone? My first attempt at coloring skin was a year ago and since then I colored less than 10 portraits. Therefore, I am not an expert but sometimes looking at photographs really helps me with choosing different colors in right places. I still experiment with lots of skin tones and learning how to observe an object. Layering and blending are very important, that’s why I always start carefully, with soft, mostly circular strokes. First I cover the whole skin with one pencil and then gradually define lines, shadows, and highlights with darker ones. After 3-4 layers I can press harder and blend colors to make it look smooth. It is still hard for me to achieve realistic look but coloring skin is definitely something I enjoy working on lately and hopefully will get better with time. 11. Coloring hair seems very challenging. What is your secret? Coloring hair is always a great challenge. Every illustrator has its own style of drawing hair and we have to adjust the lines. That’s why it’s sometimes very difficult to get a more realistic look. I usually use around 7-8 different pencils for one hair color and build up layers with rhythmic strokes. It is best to start with light pressure, from lighter to darker colors, trying to define the desired color and highlights and using heavy pressure in the shadows. It takes time but I just continue doing it until I’m satisfied how it looks. Coloring techniques depend on the part I color. When it comes to smaller parts or parts that need to be smooth, I use colored pencils and shading from darker to a lighter color with lowering pressure each time, always using a bit lighter pencils as blenders. I always add more black to edges for higher contrast. For backgrounds or some larger parts I love to use watercolor pencils and blend from light to dark color with different kinds of brushes, each may give me a different effect. If I use acrylic paint for backgrounds, I love a technique for applying 2 or 3 colors with a sponge, it’s simple and effective. 13. Sometimes people ignore the background leaving it white. But your backgrounds are always phenomenal. Any tips here? It was really scary for me to try doing backgrounds at first. I didn’t know how to draw and add things so I was afraid to ruin the main illustration. That’s why I started with the easiest ones like black backgrounds or blending with 2 or 3 pencils of the same color around the main illustration. With time it’s good to add some simple effects, like dots with gel pens, little flowers or clouds. 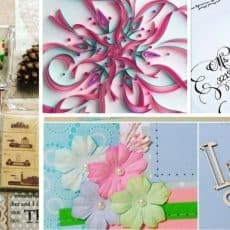 These small things will make you feel comfortable with time, and you will want to explore different techniques on backgrounds. If you feel like you have ruined the whole background, always have black acrylic paint next to you, it covers everything. 🙂 Don’t be afraid to try, you can only learn and have fun. We are truly grateful to Irena for finding time to share these amazing tips. She is a real queen of colors and mesmerizing backgrounds! What did you learn from Irena? 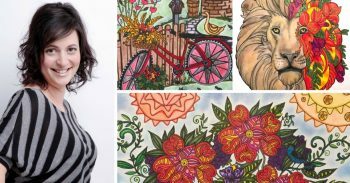 Would you like to read more interviews and get more tips from coloring pros? Leave your COMMENTS and FEEDBACK below! LIKE & SHARE this FACEBOOK POST with your friends! 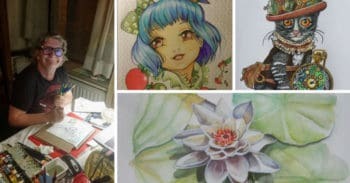 And don’t forget to apply Irena’s tips to your next artworks.